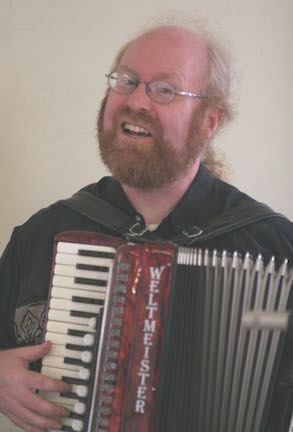 Charlie Hancock, pianist and accordionist, is equally adept playing for English country, Scottish country, contras, and display dancing. He has played for BACDS dances, camps, and balls for 18 years, with occasional gigs further afield, including Pinewoods and the Portland (OR) English ball. He is a member of Bay Area folk ensemble Euphonia, and has recorded with Sylvia Herold, Holly Tannen, and Cathie Whitesides. Infusing jazz, swing, and Irish music, he plays with brilliance, drive, and clarity.